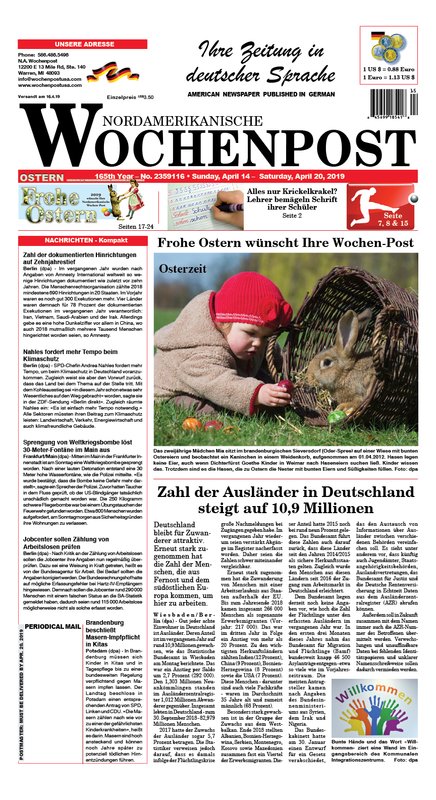 We are the Nordamerikanische Wochen-Post, America’s leading German language news-weekly. Since 1854 we have been providing our readers with an informational bridge to the homeland. Through the years, as the community has changed, we have adapted to meet its needs. From our beginnings as the Detroiter Abend-Post, the local (Detroit, Michigan) voice of the German community, we have grown to our position as a major newspaper serving the entire country. The Wochen-Post is, today, distributed in 49 of the 50 United States and various points beyond the nation’s borders. Every week we bring, in the German language, international news, business and economic reports, up-to-the-minute sports coverage, feature pages, and more to the homes and desks of our subscribers.